As we all know, Smissmas is a time for celebration and gifts. Through their Team Fortress 2 blog, developer Valve recently announced they have some gifts to share and some new stuff to show off. Through an update, all players will now have access to a new multiplayer mode called Mannpower, where grappling hooks are included in the loadout for all characters. These allow for a whole new dynamic in gameplay, as movement will be both faster and a lot more diverse. The Spiderman-like action is limited to two maps for now, Foundry and Gorge, and is as Valve stresses currently in a Beta stage. Furthermore, they added a bunch of Power-ups to the mix, "Mannpowers". These can be picked up by all classes and add abilities and enhancements. Only one can be carried at a time, and can't be taken into respawn rooms. As the development team adjust how these work, they will be removing and adding more to see how they play out. Mannpower itself is a capture the flag type of mode, with the new power-ups available and with random crit-spots disabled. This new content relies heavily on player feedback in order for Valve to get this done right and possibly incorporate it into other parts of the game. But this is not all, the Smissmas update contains a stocking filled with goodies for everyone playing during the holidays, and three brand-new weapons: the Iron Bomber grenade launcher, Quickiebomb Launcher and Panic Attack shotgun will also be available. 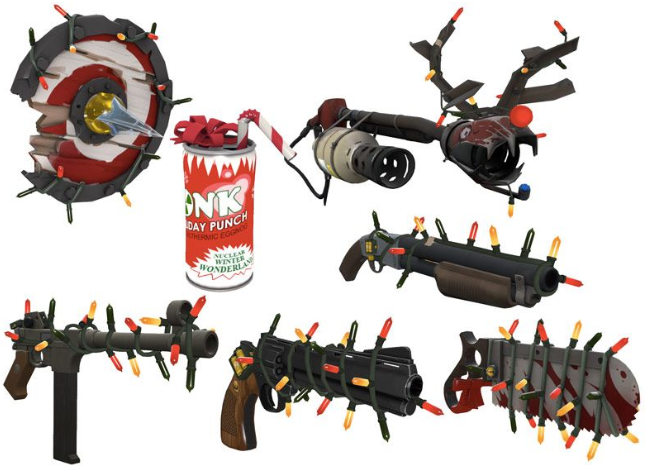 Naughty and Nice crates will contain limited weapons decorated with Christmas lights and a whopping 29 new cosmetic items. These will be a part of the game until February 16th 2015, so make sure to open yours before then if you want some of that limited stuff. "We've also made a change to MvM loot drops. Specifically, in addition to the usual Botkiller drops, there's now a chance to get Australium weapons (including the incredibly rare Golden Frying Pan) to all advanced and expert MvM tours. The tours affected by this loot drop change are Steel Trap, Mecha Engine and Gear Grinder." Is this incentive enough to keep you playing over the holidays? And what do you think the grapple hook will do to the gameplay? Is it good or bad? Are you going to get your Golden Frying Pan?